Nagy örömmel tapasztaljuk, hogy kiszervezett logisztika trendje az innovatív szemléletű webáruháztulajdonosok mellett immár rendszeresen ad hálás témát az üzleti szaksajtó számára is. Küldetésünknek tartjuk, hogy a hazai webáruházak logisztikai folyamatait hatékonyabbá tegyük, ezért megtiszteltetés számunkra, hogy a Budapest Business Journal hasábjain szerepelhettünk. A cikket megtalálhatjátok a magazin 2018. június 1-én megjelent lapszámában, de hozzájárulásukkal az angol nyelvű interjút változatlan formában az alábbiakban is olvashatjátok. 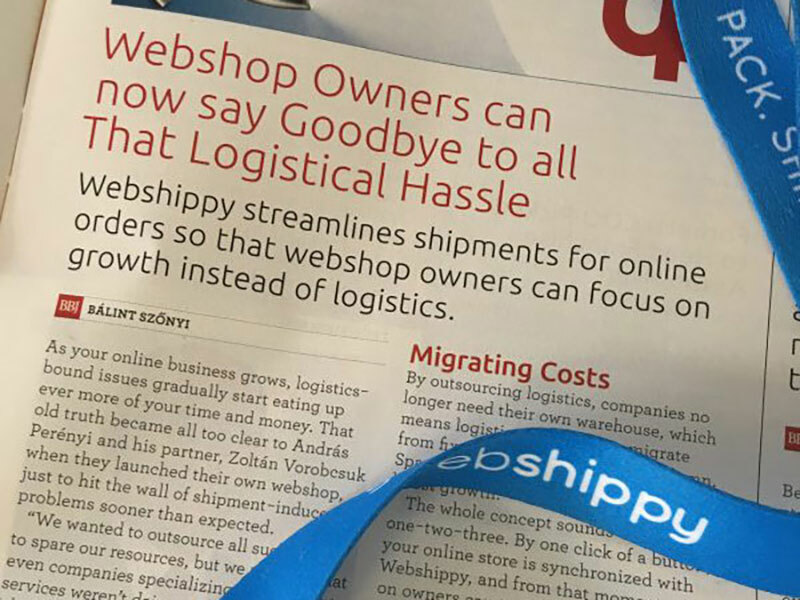 Webshippy streamlines shipment related to online orders so that webshop owners can focus on growth instead of logistics. As your online business grows, logistics-bound issues gradually start eating up ever more of your time and money. That old truth became all too clear to András Perényi and his partner, Zoltán Vorobcsuk when they launched their own webshop just to hit the wall of shipment-induced problems sooner than expected. “We wanted to outsource all such tasks to spare our resources, but we had to realize that even companies specializing on fulfilment services weren’t doing a much better job than ourselves,” recalls Perényi who therefore decided to build a startup himself and thus meet an existing market demand. Key had always been to automate processes step by step. The word quickly spread, so it wasn’t soon until the service was validated by a number of businesses. By now around one hundred customers, including fashion label Nanushka and local cosmetics giant Helia-D, make use of Webshippy’s solutions that range from storing, packing, invoicing, label generating to shipping. says Perényi. Webshippy attracts interest because it secures lucrative volume-based deals with its delivery service partners and the entire discount can be enjoyed by its customers. This way even the smallest webshops can start shipping to the region or even overseas thanks to competitive delivery rates. By outsourcing logistics, companies no longer need their own warehouse, which means logistics-bound costs migrate from fixed costs to the variables column. Spared resources can therefore be used to boost growth. The whole concept sounds easy as 1-2-3. By one click of a button, your online store is synchronized with Webshippy, and from that moment on owners can track the route of their products real-time. Storage is in Webshippy’s warehouse, and every further step from packing to hand-over for delivery takes place on the spot. As the CEO explains, after all it is all about automation on which a whole development team works. “Take a product that needs to be delivered abroad. Our system automatically determines whether a customs declaration is needed, and if so, it gets filled out and printed to be enclosed with the shipment.” Automation further allows to employ less staff to handle packaging in the warehouse and it cuts training time. Hardware-based innovation is also under way, mostly in the field of taking products into inventory. Köszönjük az interjút a Budapest Business Journal szerkesztőségének! Ti mit gondoltok, milyen versenyelőnyökkel jár egy webáruház logisztikai folyamatainak kiszervezése? Osszátok meg velünk gondolataitokat Facebook oldalunkon!